All of our Casino Quality Wood Roulette Wheels are made in the U.S.A.
Our casino quality roulette wheels feature the finest craftsmanship and quality. 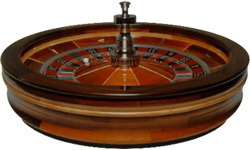 The roulette wheel bowls are made of handcrafted mahogany and other exotic woods. The wood is hand-rubbed to create a high-gloss finish. The bowl liner is cast aluminum. The dish is solid aircraft aluminum, machined by computerized numerically controlled equipment at very high tolerance levels. Our professional roulette wheels use precision bearings to ensure smooth operation. The turret is chrome-plated solid brass. All of our roulette wheels are shipped with 2 balls. You can choose from casino quality wood roulette wheels in seven sizes. These professional roulette wheels are available for immediate shipment. This heavy-duty, 16" diameter imported Wood Roulette Wheel features a polished dark wood bowl. Beautifully crafted and featuring precision spinning movement, our 16" wheel is Ideal for smaller roulette tables or those seeking an economical yet high quality Wooden Roulette Wheel. Each wheel weighs 19 pounds and comes complete with 2 balls and a rake that is storable in two pieces. Our ABS plastic roulette wheels are made in the U.S.A. of high-tech unbreakable plastic. 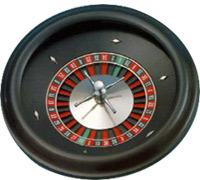 Do not confuse these roulette wheels with inferior imported wheels that are not properly balanced for random spins! The dish of each ABS Roulette Wheel is cast, machined, polished, and nickel-plated. The roulette wheel has a ball bearing for the load thrust and a bushing for guidance on the top. ABS plastic roulette wheels come with 2 balls. These wheels are available for immediate shipment. 16 Inch Plastic Roulette Wheel Sets are also available. These roulette sets are perfect for home or club use. Our plastic roulette set comes with one ball, one marker, 120 chips, 2 decks of cards, a rake, and a double-sided felt roulette/blackjack layout (30" x 18"). These 16" Plastic Roulette Sets are available for immediate shipment.